With 69% of the GB adult population supporting LGBT+ rights, it’s no surprise that many brands and companies have “come out” to nail their colours to the mast in support. Over 400 companies sponsored or paid to take part in the Pride march in London this year, and with new Pride events popping up around the country, the traditional “Pride heartlands” of Brighton, London and Manchester are no longer the only stomping grounds for LGBT+ supporters and companies wishing to appeal to the LGBT+ market. But how are brands’ activities perceived by the general public, LGBT+ supporters (i.e. those who told us they support LGBT+ rights), and LGBT+ people themselves? 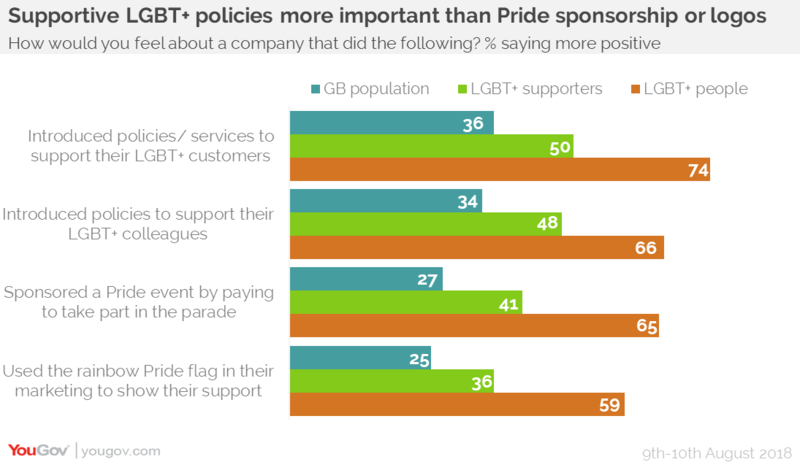 Only a quarter (25%) of Brits would view a brand more positively for using the Pride flag in their marketing, and 27% would have a more positive perception if the brand sponsored a Pride event. Among those who say they support LGBT+ rights, this increases to 36% and 41% respectively, and unsurprisingly these figures rise even further among LGBT+ people themselves (59% and 65%). The data suggests that brands looking to genuinely resonate with the LGBT+ community should also consider how they approach social issues more generally.